Being overweight or obese poses a serious health risk to millions of Americans and increases the risk for a number of diseases and detrimental health conditions, including: heart disease, high blood pressure, diabetes, and certain cancers. Using Sweet'N Low can help individuals cut excess calories from added sugars and set the foundation for a safe and effective weight management program. Overweight/obese status is determined by calculating an individual's body mass index (BMI) - a number that reflects the relationship of weight to height and serves as a good estimate of body fat. A healthy BMI ranges between 18.5 and 24.9. For example, a person who is 5'6” and 135 pounds has a BMI of approximately 21. A BMI between 25 and 29.9 is considered overweight, 30 and over is obese. 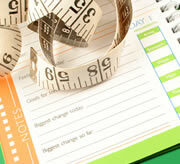 To calculate your BMI click here. Children and Adolescents (6-17 years of age): One hour or more of moderate or vigorous aerobic physical activity a day, including vigorous intensity physical activity at least three days a week. Examples of moderate intensity aerobic activities include hiking, skateboarding, bicycle riding and brisk walking. Vigorous intensity aerobic activities include bicycle riding, jumping rope, running and sports such as soccer, basketball and ice or field hockey. Children and adolescents should incorporate muscle-strengthening activities, such as rope climbing, sit-ups, and tug-of war, three days a week. Bone-strengthening activities, such as jumping rope, running and skipping, are recommended three days a week. How Can Sweet'N Low Help? One packet of Sweet'N Low is about as sweet as two teaspoons of sugar. But unlike sugar, which has 16 calories and 4 grams carbohydrate per teaspoon, Sweet'N Low has less than 4 calories which is considered by the FDA as dietetically zero and less than 1 gram carbohydrate per packet. Adults: Adults gain substantial health benefits from two and one half hours a week of moderate intensity aerobic physical activity, or one hour and 15 minutes of vigorous physical activity. Walking briskly, water aerobics, ballroom dancing and general gardening are examples of moderate intensity aerobic activities. Vigorous intensity aerobic activities include race walking, jogging or running, swimming laps, jumping rope and hiking uphill or with a heavy backpack. Aerobic activity should be performed in episodes of at least 10 minutes. For more extensive health benefits, adults should increase their aerobic physical activity to five hours a week moderate-intensity or two and one half-hours a week of vigorous-intensity aerobic physical activity. Adults should incorporate muscle strengthening activities, such as weight training, push-ups, sit-ups and carrying heavy loads or heavy gardening, at least two days a week. Older adults: Older adults should follow the guidelines for other adults when it is within their physical capacity. If a chronic condition prohibits their ability to follow those guidelines, they should be as physically active as their abilities and conditions allow. If they are at risk of falling, they should also do exercises that maintain or improve balance. Women during pregnancy: Healthy women should get at least two and one half hours of moderate-intensity aerobic activity a week during pregnancy and the time after delivery, preferably spread through the week. Women who wish to continue exercise throughout their pregnancy should first discuss with their healthcare provider. Dietary guidance in the United States has long focused on restricting “discretionary” or extra calories. With the latest release of the 2010 Dietary Guidelines that language is changing, with guidance now focusing on limiting “added fats” and “added sugars” – a simpler concept for consumers to understand and health professionals to explain. “Added sugars” are those that are added to foods and beverages during processing or preparation. They are also known as caloric sweeteners. These additions provide calories, but no nutritional benefits. According to the 2010 Dietary Guidelines, Americans should, "Significantly reduce intake of foods containing added sugars and solid fats because these dietary components contribute excess calories and few, if any, nutrients." Achieving and maintaining a healthy weight requires a commitment to sustained lifestyle changes. It is essential to guide patients and clients away from the traps of an overly-restrictive “diet” mentality and help them to focus on small, simple changes that modify unhealthy behaviors and encourage healthy ones. Read about successful weight loss strategies from individuals who have maintained a weight loss of at least 30 pounds for over a year in the National Weight Control Registry. "Aim For A Healthy Weight"